These accessories and more are available for order on the Powerdrive page and the Terrova page. Convenient, quick removal of any PowerDrive or AutoPilot™ trolling motor. Features Locking Quick Release design for smooth and easy disconnect. Original patented AutoPilot and PowerDrive design. Protect your bow- or stern-mount trolling motor from bouncing while running in rough water or trailering your boat. 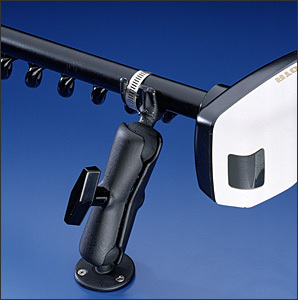 The R-A-M Arm mounts at any angle and holds the motor shaft secure, preventing the motor head from hitting the deck and causing damage. Simply loosen the knob in seconds and put the motor in the water when its time to fish. Complete system includes base, arm and clamp base. If there are any accessories you don't see email us at jollyannmarine@gmail.com with a manufacturer's part number and we will get back to you with a price quote.